Decompile Flash Free Version 2.1.2.1688 - Download Win Apps. convert flash between SWF and FLA format..
DFFV is an outstanding SWF decompiling tool which allows you to convert flash between SWF and FLA format. You can extract the elements from a flash movie (shapes, sounds, images, sprites, fonts, texts and scripts etc.) 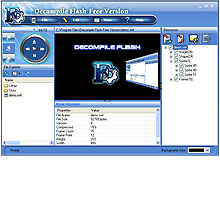 Decompile Flash offers the powerful function of editing texts of flash movie and replacing images as your own easily and watch the edited result immediately. In comparison to Decompile Flash Free Version is supplied as a stand-alone application for decompiling flash movies. It enables you to convert SWF to FLA format which can easily be edited in native Flash environment and convert between swf and exe format.